WE will have your group FISHING IN 5 MINUTES! BOOK your PRIVATE FISHING CHARTER with Captain Bill and climb aboard the Naughty Girl for an incredible adventure! 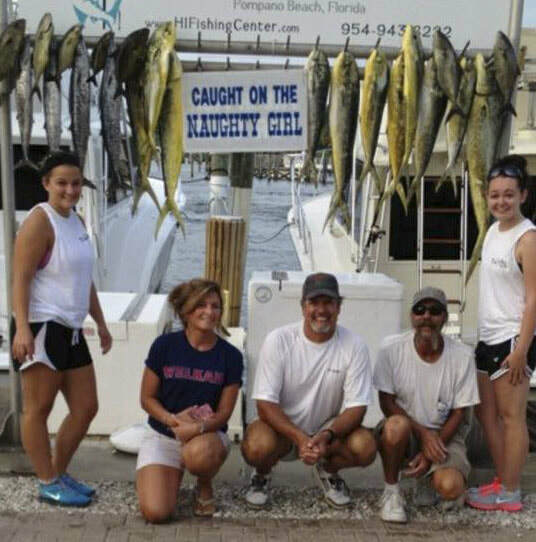 Naughty Girl Sport Fishing Charters of Pompano Beach, FL will have your group fishing in 5! From South Beach, Miami to the South Florida Coast we are situated close to the blue ocean and rich fishing waters of the Gulf Stream where the big fish live! We are just minutes from Ft. Lauderdale & Boca Raton, 30 minutes from Palm Beach, an hour North of Miami and 3 hours (200 miles) from Orlando. So come aboard The Naughty Girl and LET'S GO FISHING! ​​Anglers who sign up for the Naughty Girl will not only be minutes from deep-sea fishing, they're in a position to catch tuna, marlin, swordfish. The inlet fishing and light tackle fishing often ends with amazing results. You never know what you're going to catch so we're ready for anything. An exciting journey into the blue waters of big game fishing. Discover the fish species that make South East Florida the top recreational fishing. Choose 4 - 6 - 8 hour trips. We also offer day or night Swordfish-Shark trips. Contact Captain Bill for more details. THE NAUGHTY GIRL IS FULLY-AIR CONDITIONED, BEGINNER & EXPERIENCED ANGLERS WELCOMED! WE ARE A FAMILY FRIENDLY FISHING CHARTER BOAT AND BUSINESS! WE WILL DO EVERYTHING TO HELP YOU CATCH THE FISH YOU WANT, WHILE MAKING MEMORIES THAT WILL LAST A LIFETIME! GROUPS UP TO 6 ON BOARD, ASK ABOUT ACCOMMODATIONS FOR BIG PARTIES - 7 DAYS A WEEK! GET OFF THE BEACH AND INTO OUR BOAT FOR 1 DAY! YOU WILL CRUISE THE COAST AND DEEP BLUE WATERS OF THE FAMOUS GULF STREAM - INTRACOASTAL WATERWAY ROUTE OF THE ATLANTIC OCEAN. SEE FLORIDA LIKE YOU'VE NEVER SEEN IT BEFORE. TRY SOMETHING NEW! EXPLORE OUR FLORIDA OCEAN AND MARINE LIFE. MAKE MEMORIES AND HAVE THE TIME OF YOUR LIFE WITH YOUR FAMILY OR GROUP FOR LESS THAN THE COST OF A FAMILY DAY AT AN AMUSEMENT THEME PARK IN OUR STATE!!! YOUR OWN PRIVATE BOAT CHARTER AND CAPTAIN, NO LINES, NO WAITING, PARTAKE IN A UNIQUE HANDS-ON LEARNING EXPERIENCE & EXPECT AN ADVENTURE. YOUR EXPEDITION - YOUR WAY!